Resource center Therapy Options for Family Members Overcoming Addiction What Is Holistic Therapy, Who Needs It? How Long Does Addiction Treatment Last? Is Addiction Treatment Covered by Medicare/Medicaid? 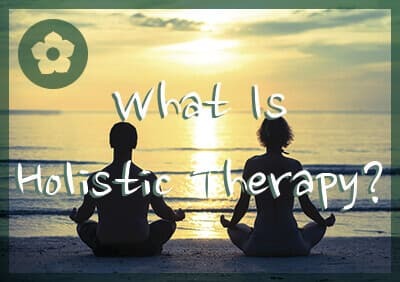 What Is Holistic Therapy, Who Needs It? Who Is Dialectical Behavior Therapy Best Suited For? Holistic therapy abides by these same principles. It’s not just about analyzing the emotional state or changing thoughts and behaviors. It’s about all the ways in which people interact with their world and their overall sense of being. Clients are guided toward self-awareness and then allowed to lead their own journey through self-discovery and healing. Holistic treatment is a response to what some people see as a more reactionary approach to health – the tendency to treat symptoms only, instead of finding and treating the root cause. Many people who have felt like traditional medicine has failed them have turned to holistic medicine in hopes that their practitioners will understand the complex nature of their illness, dig deeper into the source(s) of the issue, and focus their treatment on the whole person, not just the obvious symptoms. For example, someone with chronic pain might come to a holistic therapist to explore possible psychological sources of their suffering. Stress and anxiety can contribute to chronic pain, and if an emotional issue or past trauma is the source of that stress, dealing with it could alleviate many of the symptoms of pain. Instead of simply prescribing pain medication, a holistic therapist may take approaches such as teaching the client to be aware of where the pain originates in the body, look at behaviors that might contribute to the pain (bad posture, repetitive stress, eating habits, etc.) and using cognitive-behavioral therapy to address unresolved issues and triggers. In 2007, 38.3 percent of adults and 11.8 percent of children accessed some form of complementary and alternative medicine (CAM), according to the National Center for Complementary and Integrative Health. CAM includes many different types of therapies and treatments designed to treat more than outward physical symptoms, and the term is often used as an alternative for holistic medicine. Holistic therapy borrows from the theory of psychosynthesis. This is the idea that all living beings naturally strive to become the fullest realization of themselves, and the best way to grow is to consciously cooperate with this natural tendency. Human beings are uniquely capable of understanding and facilitating this process through therapy, self-reflection, meditation, and any number of other methods one might prefer. The term psychosynthesis was coined by Italian psychiatrist Roberto Assagioli in 1911. It was created as an attempt to fill gaps that many early mental health experts felt Sigmund Freud had left in his theories on the human psyche. Assagioli felt that Freud had left out the “higher” aspects of humanity in his works and that his theories weren’t inclusive enough for the open and complex human nature. Psychosynthesis was therefore created as a concept that included many different aspects of human growth and remained open to any others that might be discovered. Naturally, psychosynthesis draws from both Western and Eastern theories on health. Eastern psychology has tended to focus more on the spiritual side of health, while its Western counterpart focuses more on personality and neurobiology. The point of psychosynthesis is to combine these and all theories to ensure that clients experience total healing and are able to realize their full potential and express the “Self” in the purest, most natural way possible. The self refers to a person’s essence – who they truly are under all the baggage, expectations, and defenses that every individual tends build up. With “compassionate attention,” clients are guided to rediscover the Self that is often hidden behind the many identities they may have formed for themselves. At the same time, psychosynthesis is flexible enough to acknowledge that each individual is just that – a person with unique needs and a unique history that will inevitably make one kind of treatment or a group of treatments more effective than another. Many holistic therapists will therefore start with techniques that fit the client best, and once the most pressing needs are met, focus on determining how to round out their health. To start, the therapist will get to know the client. In order for therapy to be effective, there must be a sense of trust between client and therapist. Understanding the client’s concerns and goals and truly listening will help the therapist to understand the client’s worldview and what they are looking to get out of therapy. The therapist is also likely to recommend any number of physical treatments and/or spiritual pursuits, depending on the interests of the client. Knowing that clients are more likely to keep up with treatment that they are interested in and that engages them in ways they enjoy, holistic therapists count on the idea that healing one aspect of health will naturally lead to healing in other aspects. For example, someone who enjoys physical fitness may be encouraged to work on physical health techniques like yoga, massage therapy, acupuncture, and healthy eating. The resulting boost of energy and mood makes working on other types of health easier. Holistic therapy doesn’t have a clear end, and in fact, if the client so chooses, may never end at all. Because the therapy is client-centered and based on client self-awareness, the individual decides when therapy ends. Even then, the idea behind holistic therapy is that personal growth is an ongoing process that never ends. Clients may decide to return to therapy at a later time if they find something has come up that’s once again impeding their growth and they need guidance to overcome it. The term holistic can come with a bad reputation, sometimes used in conjunction with naturopathy and homeopathic medicine. However, widely accepted and accredited treatments, such as chiropractic and massage therapy, are forms of holistic medicine. Today, approximately half of all US medical schools include discussion of CAM in their course offerings or clerkships. Acceptance has generally increased among the medical community in recent years, including the psychology community, as more studies come along that demonstrate the benefits of a holistic approach to any medical problem. 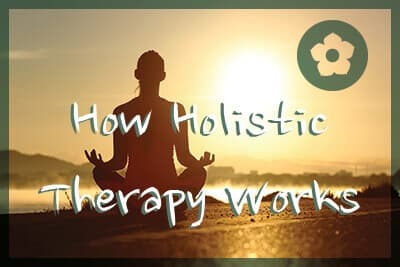 Most of the criticisms against holistic therapy and CAM focus on specific treatments that may lack evidence of effectiveness or have difficulties in defining these terms. People often use holistic and alternative medicine interchangeably, but not all alternatives to standard Western medicine approaches are holistic – that is, they don’t all focus on the overall health of the individual. Massage therapy, for example, tends to focus only on the muscles or muscle groups that are currently hurting, loosening them up to reduce or eliminate pain. However, massage therapists would be unlikely to attempt to figure out any emotional or mental issues that might be causing the muscle tension in the first place. Holistic therapy may encourage or include complementary and alternative medicine, but CAM is not necessarily holistic. Homeopathy: The use of tiny, diluted amounts of substances that are thought to activate the body’s natural defenses, curing health problems without the side effects of common medications. Reflexology: The theory that there are pressure points on the body, particularly the hands and feet, that can create physical changes in the rest of the body. Magnetic therapy: The use of magnets, often placed in bracelets, headbands, or shoe inserts, to improve blood flow, based on the fact that the human body contains iron. Reiki: A spiritual practice originating in Japan that involves placing hands on or just above the client’s body to transmit healing energy. Many other alternative treatments have been shown in at least some studies to cause greater improvements in subjects than the placebo effect, but they are not well understood in a purely scientific sense, resulting in suspicion and sometimes outright dismissal. For example, in a 2012 study on acupuncture, pain scores for participants were nearly halved after receiving this treatment compared to those who did not receive the therapy or those who received “sham” acupuncture (deliberately ineffective acupuncture). However, medical science is yet fully unable to explain how inserting needles into certain points on the human body relieves pain. When it comes to holistic therapy, effectiveness is difficult to measure due to its very nature. If you’re incorporating both Western medicine and alternative treatments, how can you be sure what caused the person to improve? Anything that treats emotional, mental, and spiritual health is also complicated due to the fact that it’s impossible to (ethically) run the kind of double-blind experiments that are considered to erase bias from the experimenters and from the subjects. Psychology itself is often referred to as a “soft science” for this reason. It’s subject to a lot of interpretation, and any studies are vulnerable to interference from multiple sources. However, many medical professionals agree that this does not make it invalid. There are also many millions of people who can speak to the effectiveness of holistic therapy, holistic medicine, and CAM. Statistics mean little to the individual. Only you will be able to determine whether holistic therapy is a better choice for you than standard medical treatments.